Jeff Dillard was one of the first chronically homeless people housed under the "housing first" model in Oklahoma City. 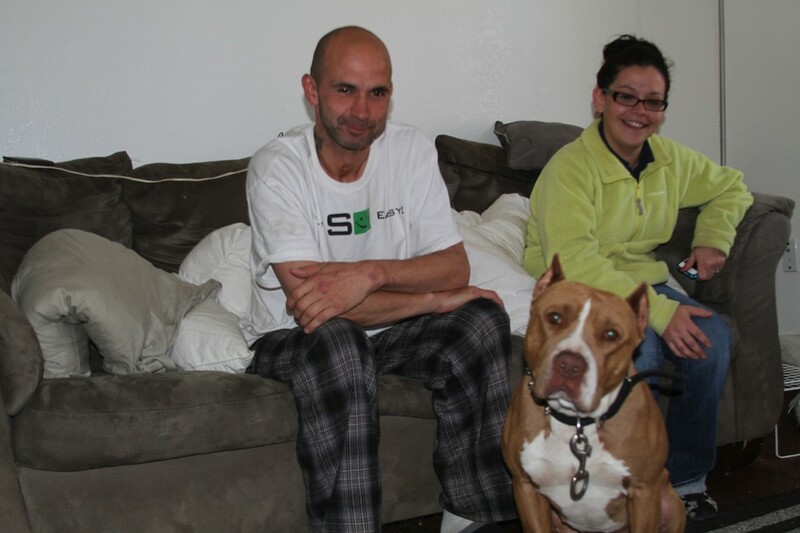 Shown with him are Kristina Trujillo, his case manager, and Boopsie the dog, whom he took in from the streets. Boopsie sniffs the air, curious about the guests in his and Jeff Dillard’s home. After a cautious approach, the pit bull terrier, who has scars from fighting, lays his head on a guest’s lap. Dillard smiles. He took the dog into his home in February after he heard him barking on the street at 3 a.m. Boopsie’s former owner, a homeless man who used to fight Boopsie against other dogs for money, abandoned him and left town. “We’re best friends,” Dillard said. Dillard, 44, is one of the first homeless people in Oklahoma City housed by the Homeless Alliance in January under the “housing first” model, in which the homeless are put in homes with few stipulations. Dillard lives in an apartment near downtown. So far, things are going well, he said. Being in a home – and being connected by the Homeless Alliance to services – has helped him focus on the future, Dillard said. “I couldn’t have told you before what day or month it was because my mind was on more where am I going to be tonight, what’s going to happen tomorrow?” Dillard said. “I was drinking a lot and was getting in trouble for public intox. Like Boopsie, Dillard bears scars from the past. He has a mark on his shaved head from a brain injury suffered in a construction accident in Phoenix a few years ago. He also has a scar from when another homeless man attacked him with a knife in October in Oklahoma City after Dillard refused to hand over his cigarettes. Kristina Trujillo is Dillard’s case manager. She said Dillard has shown major improvement since he was housed, and she and her husband often visit to see how he’s doing. “Things are starting to look up for Jeffrey,” Trujillo said. Dillard said he has reconnected with his family, especially his mother, though their relationship is not back to where it was before he became homeless. Now the goal is to prove to his mother that he can stay housed, Dillard said.